Howard has practiced law in the private sector for more than 30 years. 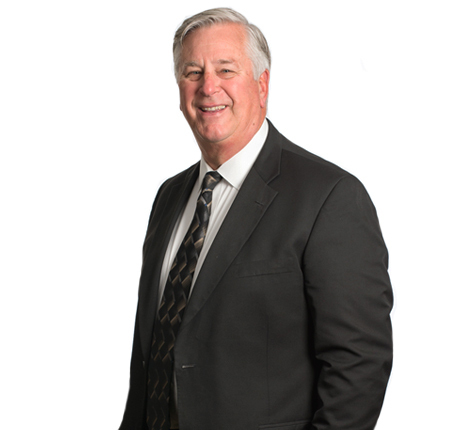 He is the founder of Estate & Business Law Group, P.C., and has dedicated his practice to designing estate and succession plans for individuals, families, and businesses. Howard has received the prestigious “AV” rating from Martindale-Hubbell which represents recognition by his peers for legal knowledge, analytical capabilities, judgment, communication ability, and legal experience. He is active in local and statewide Bar Associations. In addition to practicing law in the private sector, Howard served as a Special Assistant Attorney General for Illinois, Assistant State’s Attorney in Cook and Lake Counties, IL, and as a Hearing Officer for the Illinois Pollution Control Board. Howard served on active duty as an enlisted airman (Staff Sgt.) and officer (Captain) in the United States Air Force from 1967-1971, and retired as a Captain in the United States Navy JAG Corps. Howard’s work in the community has included service as an elected school board member in the position of Vice President and membership on several village committees and boards. He currently serves as President of the Village of Libertyville Foundation and recently co-organized a public charity, Military Outreach USA, where he is a director and officer. Northern Illinois University, B.A., (Economics), 1967. Illinois Institute of Technology, Chicago-Kent College of Law, J.D., 1974. Contributing Author, “Your Life Your Legacy (2003) and Your Life Your Legacy II ( 2009),” The IL/WI Forum of Estate Planning Attorneys. Contributing Author, “Generations: Planning Your Legacy,” The Esperti Peterson Institute, Omaha, NE, 1999. Co-author, “Legacy: Plan, Protect and Preserve Your Estate,” The Esperti Peterson Institute, Omaha, NE, 1996. Former Collaborating Editor and Reviewer, “Conspectus Current,” The Esperti Peterson Institute, Omaha, NE. Co-author with Jonathan Blattmachr, “IRAs, Hot Topics and Recent Developments in the IRA/Qualified Plan Distribution Arena: From the Sublime to the Ridiculous,” Conspectus Current, The Esperti Peterson institute, Omaha, NE., Summer 2000. Co-author with Keala Timko, Family Business Governance, Transition and Transformation: Gaining a Competitive Advantage, Journal of Practical Estate Planning, CCH Incorporated, September 2005. Speaking engagement, “Your Professional Future,” National Press Club, Washington, DC, August 30, 1995. Co-founder and Chairman: Illinois/Wisconsin Forum of Estate Planning Attorneys. Co-founder Fellow and Officer: Estate Planning Institute of Collaborative Resources (EPICOR). Fellow: Esperti Peterson Institute, Omaha, NE. Committee Member: Lake County Bar Association; Wills, Trusts, Probate Committee. Founder & Director: Arab-American Bar Association of Illinois.